The Raleigh Cadent 1 Urban Fitness Bike is a sturdy creation for cyclists with practical needs. Do you want something that can handle daily commutes in the city as well as dirt roads and rocky trails? Then, this might be your ride. To decide whether this Raleigh Cadent 1 Urban Fitness Bike is for you, ask yourself what your requirements are. If you are a keen city cyclist who sticks to smooth pavements than maybe you need a dedicated road bike. If you love dirt roads and hitting the mountain trails, then go for a beefed up mountain bike with shock absorbers. The Cadent 1 is meant for cyclists who want a mix of the two experiences without the extra investment or hassle of owning two bikes. As far as hybrids go, the Cadent 1 boasts good quality components in a lean, lightweight package. 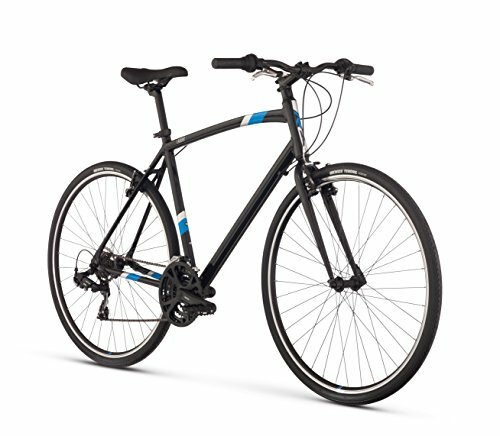 For the practical cyclist, this inexpensive bike is an excellent deal. While the design of the cycle favors the more upright posture of mountain bikes, the lightweight aluminum frame adds extra speed and efficiency to every ride. You can fly down bike paths on this cycle and still enjoy a sturdy build that does well on uneven grounds. Do you love to ride on changing terrains? Then, you can go with Raleigh Cadent 1 Fitness Bike that’s what these tires are made for. The 700c wheels and wider 35mm tires allow you to transition smoothly between hilly roads and flat, city streets. You’ll never feel at a disadvantage with this beginner bike, no matter what path you choose to ride on! The steel, mid-rise handlebars are fixed at an easy reach for a comfortable bike ride. It helps you sit up straighter, which in turns keeps your spine from being strained. This is ideal for riders who want a cycle to stay fit. While the flat handles don’t allow you to optimize your speed by leaning forward, they are perfect for daily commutes and long rides on weekends. The 3×7 speed shifters from the Shimano Tourney line give you a choice of 21 gears. This really opens up the possibilities for what you can do with this bike on the road. The saddle on this bike is a good fit for casual cycling. But if you’re looking to go on a day-long ride, you might consider switching to something more comfortable and with better support. The Raleigh Cadent 1 Fitness Bike comes nearly built right out of the box. With 85% of the work done, you can be on the road within half an hour of bringing the package home. Of course, if this is your first time building a bike, you might need some help tuning the derailleurs and fitting the brakes properly. Expert’s advice that even if you think you’ve done a wonderful job, it pays to be safe and get your local bike shop to look over your handiwork. Hybrid bikes can come in many flavors, but the Raleigh Cadent 1 Urban Fitness Bike has a simple goal. It wants to become your go-to cycle for every need. The quality of the parts used to build this two-wheeler ensures a long, durable life, while the smooth shifters and the wide, semi-smooth tires promise memorable rides on a variety of terrains. The Cadent 1 isn’t really designed to be a racing cycle with its wide tires, sturdy frame, and erect bearing, and neither is it a proper mountain bike. But it offers you the best of both worlds at an extremely affordable bike under $500. So, for the cyclist who loves the outdoors but mostly wants a bike that can be his daily ride, this Raleigh offering is the perfect fit.